The Fed is now officially expressing optimism about the economic turnround that is supposedly taking place. WSJ: Federal Reserve Chairman Ben Bernanke said Tuesday that the recession was "very likely over," as consumers showed some of the first tangible signs of spending again. Mr. Bernanke, who had become cautiously more upbeat in recent weeks amid signs of third-quarter growth, said for the first time that forecasters agree "at this point that we are in a recovery." If the Fed is really confident we've turned the corner, they should be getting ready to raise rates. Fed Funds were at 18 basis points today - that is banks are lending to each other at 0.18% annualized. It's basically interest free money. So if what Mr. Bernanke said this week is true, the Fed is preparing to be (or at least thinking about) raising rates. But the market doesn't believe the Fed is going to raise rates any time soon. The Fed Funds futures, the market's bet on where overnight rates will be in the future, are forecasting a rate increase that's increasingly further away. 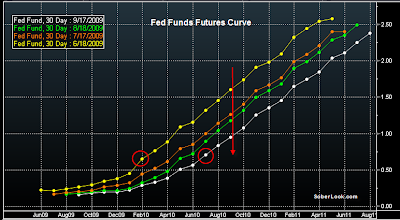 The following chart shows the futures curve changes from June-09. In June the market was expecting that by Feb-2010, the overnight rate will be near 75 bp - indicating a couple of increases by early next year. But now the first increase is not priced in until May - June, and it will be July - August before we reach 75 bp. The market is expecting the Fed to keep a near zero rate policy for another 8-9 months. That is obviously contributing to market strength, particularly in fixed income, but keeping rates at zero in a growing economy is a dangerous game. There are two possible outcomes here. Either the Fed doesn't really believe the recovery they announced is real and will keep rates near zero for a long time, or the markets are in for a big rate hike surprise.